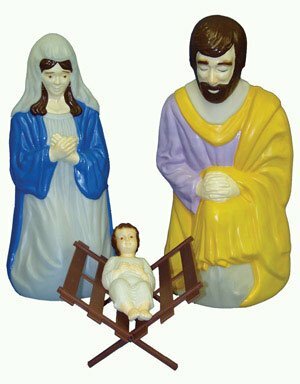 General Foam C5540AC Life Holy Family Size Nativity Collection, 4 Piece by General Foam Plastics at Two Clock. MPN: C5540AC. Hurry! Limited time offer. Offer valid only while supplies last. Christmas Theme: Blow Mold Holy Family. Color: Multicolored. Material: Plastic. Dimensions: 39 in. Number in Package: 4 pc. Outdoor. Length: 39. Christmas Theme: Blow Mold Holy Family. Color: Multicolored. Material: Plastic. Dimensions: 39 in. Number in Package: 4 pc. Outdoor. Length: 39. Power Type: Non-Electric. Number in Package: 4 pc.